On April 20th, H.E. Ms. Wang Ke, Chinese Ambassador to Barbados, accompanied Mr. Huang Jin, Vice-President of China Law Society and President of China University of Political Science and Law, to pay a call on Sir Marston Gibson, Chief Justice of Barbados. 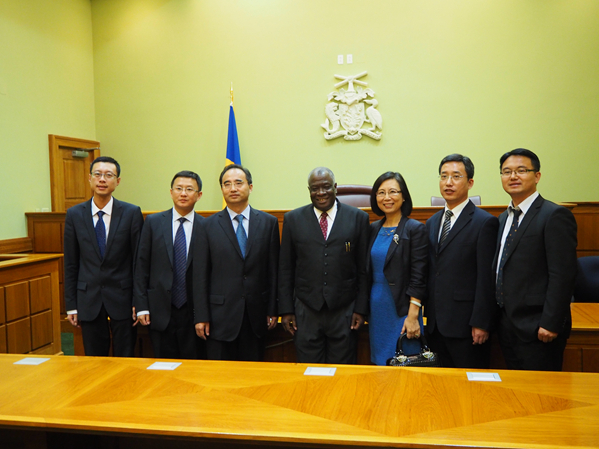 The two sides discussed in depth on the issue of respective legal system of China and Barbados, as well as the further enhancement of the legal exchanges and cooperation between the two countries. Mr. Huang, on behalf of the CLS and CUPL, welcomed Sir Marston to visit China and give a lecture to the teachers and students of the CUPL in May. Sir Marston expressed that he was really looking forward to this visit, and was willing to learn more about China and promote the exchanges between the legal communities of the two countries through this visit.